The Central Bureau of Statistics on Sunday released statistics on the 158,000-strong Christian community in Israel. 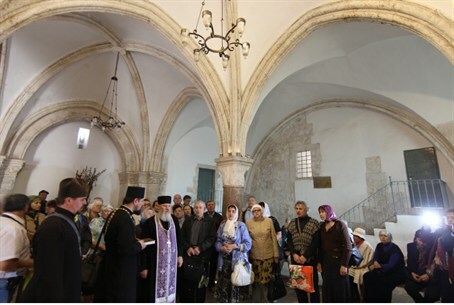 The statistics showed that Christians living in Israel are well-educated and prosperous – but there were fears that Muslim intimidation in cities in northern Israel, where many of them live, are causing large numbers to consider emigrating to the West. Christians make up just 2% of Israel's population, with most of them being Christian Arabs who live in northern Israel, many of them in the lower Galilee between Nazarath and Haifa. However, their numbers actually grew somewhat in the 1990s, as Christians from the former Soviet Union who were given Israeli citizenship due to loopholes in the Law of Return – including, for example, grandchildren of Jewish immigrants from the former Soviet Union who were given Israeli citizenship as part of family unification programs. About 20% of Christians in Israel are of European origin, and about 40% of those Christians live in the Tel Aviv area, with the rest located in Haifa, Jerusalem, and the south. About 30% of all Christians in Israel are age 19 and under, similar to the 33.5% of the Jewish population in that age category. That statistic holds true for Christian Arabs as well, even though they live in proximity – cultural and geographical – to Muslim Arabs, 48.7% of whom are 19 and under. Christian families can expect to have 2.2 children – significantly less than the 3.5 children a Muslim woman can expect to have, and the 3.0 children Jewish women have on average. Christian Arabs also marry later than Jews or Muslims, by between 1.5 and 2 years, the CBS statistics said. When it comes to education, Christian Arabs are among the most successful groups in Israel. In 2011, 64% of the community's high school graduates were eligible for Bagrut matriculation certificates, generally a requirement for entry to university, while among Jews that figure was 59%, and only 48% among Muslims. The CBS statistics also showed that Christian Arabs enjoyed relatively high incomes, and were generally more prosperous than their Muslim neighbors. But there is concern that the Christian community is shrinking – due to intimidation by their Muslim neighbors. In 2009, On the eve of Pope Benedict 16's visit to Israel, an Israeli research group said that the number of Christians living in Jerusalem had shrunk to 14,000, down from 31,000 at the end of the British Mandate – only 2 percent of the city's population, and far fewer than the 20 percent it constituted in 1946. As such, Jerusalem is following a pattern which has been taking place in other cities as well: Once-large Christian communities see their numbers dwindle, as Christian Arabs emigrate or move and are replaced by Muslims. In 1946, there were 97,000 Jews, 31,000 Muslims, and 30,000 Christians in the city. The number of Christians in the city dropped drastically between 1948 and 1967, and has remained static ever since then. Meanwhile, the Muslim population grew exponentially during that time, and now constitutes about 230,000 people. Many Christians have complained of being targeted by Muslims, whom they believe are trying to either drive them out of cities that have traditionally had large Christian populations, or to "persuade" them to convert. In 1999, for example, radical Muslims in Nazareth rioted as they attempted to wrest land from a major Christian shrine to build a mosque. Christians in Bethlehem, too, have complained of being persecuted by Muslims, and being encouraged to leave. In 1946, Bethlehem was 80 percent Christian and Nazareth 60 percent; those numbers are now 20 percent and 30 percent respectively, with the percentage of Christians in the city shrinking every year.